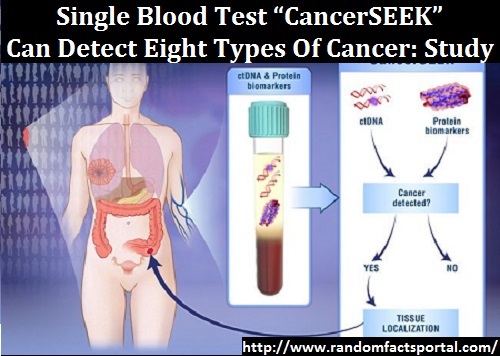 Experts have found a single blood test called CancerSEEK that can detect eight common cancer types and helps identify the location of the disease. It is a unique noninvasive, multianalyte test that simultaneously evaluates levels of eight cancer proteins and the presence of cancer gene mutations from circulating DNA in the blood. According to researchers, the test is developed at screening for eight common cancer types that account for more than 60 percent of cancer deaths in the US. Five of the cancers covered by the test currently has no screening test. According to the study published in the journal Science, CancerSEEK is noninvasive and can, in principle, be administered by primary care providers at the time of other routine blood work. The investigators initially explored several hundred genes and 40 protein markers, whittling the number down to segments of 16 genes and eight proteins. They point out that this molecular test is solely aimed at cancer screening and, therefore, is different from other molecular tests, which rely on analyzing large numbers of cancer-driving genes to identify therapeutically actionable targets. In this study, the test had greater than 99 percent specificity for cancer. The test was used on 812 healthy controls and produced only seven false-positive results. It was evaluated on 1,005 patients with nonmetastatic, stages I to III cancers of the ovary, liver, stomach, pancreas, esophagus, colorectum, lung or breast. The median overall sensitivity, or the ability to find cancer, was 70 percent and ranged from a high of 98 percent for ovarian cancer to a low of 33 percent for breast cancer. For the five cancers that have no screening tests are stomach, ovarian, esophageal, liver, and pancreatic cancers, sensitivity ranged from 69 percent to 98 percent.